derSammler wrote: Finished something I started quite a while ago: An ESS 1688 soundcard with Dreamblaster S1 and 128 MB DOM on primary IDE. Boots right into MS-DOS 6.22 with the sound card already set up. Perfect for a bridge-board Amiga or to quickly test a mainboard without having to attach floppy, harddisk, etc. Wow, that's awesome! I'll be honest, I've never even heard of a DOM before. How does this work exactly? I didn't know that sound cards with IDE interfaces were actually bootable. That card, a Formosa 1630 (aka "Audio Star 16"), is one of very few cards whose IDE port can be configured to primary. Since it's non-PnP, even a 286 can then boot from it (which was my test system -> works great!). Finding the DOM was rather hard, as that construction form is quite unusual. But I wanted exactly that form so that it does not block or collide with an ISA card next to it. Had to import it from the US and paid quite a bit. derSammler wrote: That card, a Formosa 1630 (aka "Audio Star 16"), is one of very few cards whose IDE port can be configured to primary. Since it's non-PnP, even a 286 can then boot from it (which was my test system -> works great!). Definitely looks handy! I wonder if there's a list anywhere of soundcards that have bootable primary IDE like yours. I see a lot of them are 44pin female connectors. Must be kind of tough to find things that those will work on without weird adapters. bjwil1991 wrote: Had to re-install Windows 98SE a few times last night due to unforeseen cicrumstances with the ACPI BIOS driver causing issues (GPU conflicting with the ACPI BIOS driver for some reason), yet I cannot disable the ACPI in the BIOS since there is no option for the HP Pavilion 7955 (ASUS P4B-LA) motherboard BIOS. I also attempted to create new profiles after re-installing Windows 98SE with no success mainly because I copied the files over to the appropriate profiles too early and forgot to reset the computer. Going to have to re-install Windows 98SE again when I get home by deleting the Windows directory entirely. Some HP desktops allow you to go to the advanced BIOS settings by pressing Ctrl-F11 or Ctrl-Alt-F11 at post. Something like that anyway. Maybe you can access the ACPI that way? Worth a try. That seems to be the same, but I paid a bit more back then (+shipping). A standard DOM with 128 MB cost just 95 cents here in Germany. Got the Neptune running. Looks like an XT when it boots. The BIOS has some serious design flaws, it seems. After the reworked DALLAS was inserted, it kept asking for a password that wasn't even set. And the jumper for password on the mobo was set to "disable". After many resets, it stoped asking for a password. More funny, the BIOS keeps crashing when trying to enter it with the date not set. It also can not boot from hard disk in this case. So you need to boot from floppy first, set the date, and after that you can enter the BIOS and finally boot from hard disk. It has the original BIOS from 10/94. Anyone knows if there is a newer BIOS available? Just found that last BIOS from late 1995. Disabled the ACPI BIOS after pressing the Ctrl-F11 key combo to get more options, and it did help somewhat. When I restart Windows, even if it freezes, I get a code 12 on the GPU stating it cannot get resources for some reason, and when I checked the resources, they're all correct and not conflicting with anything whatsoever. The BIOS is version 3.05, which will be upgraded to 3.11 (HP OEM ASUS P4B-LA motherboard). BTW the Abit board works with a K6-3, and I've had it POST with a Rise MP6 266. This board works with everything. Secured the purchase of a Diamond 3dfx Voodoo 2 8MB and a Creative Sound Blaster 16 CT2920 (This card is absent on Creative's own list of products funnily enough, it seems to be a PnP version of the CT2290, which is a fantastic SB16 if I may say so myself). Now I am considering completely retooling my Slot 1 P3 system; it was a P3 450 (which was currently being upgraded to a P3 700) with a Voodoo 3, now I'm thinking of turning that P3 700 system into a GeForce DDR or GeForce 2 GTS + Voodoo 2 SLI setup. Worth it? Does anyone know how to get the Media vision Pro Audio Studio 16 to work in MS-DOS? I cannot seem to figure out what TSR program it is for voice and sfx. I received a pack of 25mm heatsinks today, so I put a few of them on the Voodoo2 card in my Slotket build. In case you're wondering what I used to stick the heatsinks on, I cut up an 80mm thermal pad into three squares that match the size of each heatsink. Now I don't have to worry about losing the card from heat issues. 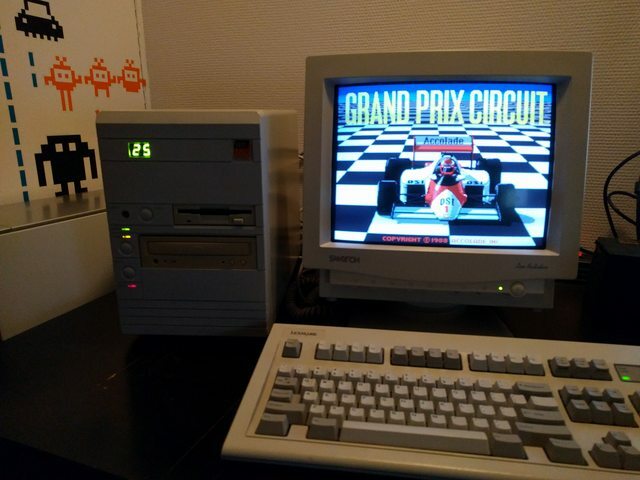 Found some games, transferred them to the 486SX and played them. Dangerous Dave is a hard game! Fascinating that I still know the levels after more than +-20 years. I’m pretty sure that a house full of rare, boxed, classic hardware beats a fantasy shed filled with “under discussion” pallets of used retro computers, but maybe I’m measuring it wrong. bjwil1991 wrote: Does anyone know how to get the Media vision Pro Audio Studio 16 to work in MS-DOS? I cannot seem to figure out what TSR program it is for voice and sfx. In my experience you need the correct version of the drivers for your specific PAS16 but start with the installer package on Vogon Drivers. If that doesn’t work then try the Pro Audio Studio package you’ll find there too. Under discussion just became done deal. There mine as soon as I get the shed 2 paychecks from now (prebuilt building vender most likely). It's quantity vs quality I guess. Subjective as usual too. Finished my "modern" retro box (for games all the way to about 2009). Will have to make a seperate post in the System Specs thread to show it off. This is semi-retro... only because it involves a PC I built in 2008 that is still used heavily. My sister has been running out of space on her PC since she got a new camera several months ago. She takes tons of high res photos and videos. The system is actually based on my first dedicated HTPC in a really sweet little Athenatech micro-ATX desktop case. Funny thing I've noticed... there are a lot of arcade computers that use this case, sometimes ones made to replace Quantum3D Graphite systems. They are somewhat similar in size. Anyway, the system now contains an Asus M3A78-EM AMD780G board (original), was upgraded last year to a Phenom II 840T (from an Athlon X2 5050e), 4x2GB DDR2-800 (had 2x2GB before, and I actually found another 2x2GB of the same low profile DDR2 recently for a perfect match), Sandisk Ultra 240GB SSD + WD Blue 2TB HDD (had only a Seagate 7200.10 250GB before), Geforce GT 520 (had an 8600GT which is getting pretty outdated driver-wise... this should be perfect), FSP micro-ATX PSU (350W bronze unit I believe... replaced the original Sparkle unit that died 6-7 years ago). The thing runs beautifully now! And if she ever needs a newer system, the SSD and HDD will migrate over easily. From retro to modern with a few upgrades. Well, I made my whole garage REEK of ozone today. I'm conducting some "experiments" with the retrobrite cream. Results are so far disappointing, but not entirely surprising. Once I get things a bit more hammered out, I'll share some details. luckybob wrote: Well, I made my whole garage REEK of ozone today. I'm conducting some "experiments" with the retrobrite cream. Results are so far disappointing, but not entirely surprising. Once I get things a bit more hammered out, I'll share some details.